My favourite thing to do in the world of puppetry is build puppets. 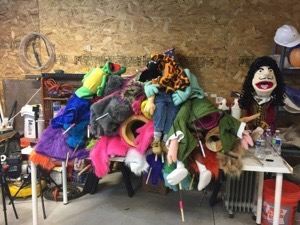 I have been building puppets for 15 years, mostly out of foam in what is known commonly as Muppet style. 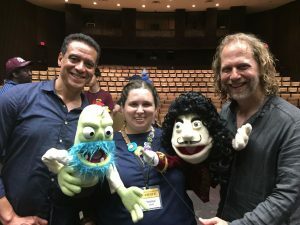 When Lucy Green and I attended Beyond the Sock Puppetry for Television and Film Workshop in June this year, one of the special features of this year’s workshop was that attendees were given two puppet patterns to build. Pattern A was a round head pattern, and pattern B is a tall, pill shaped head. 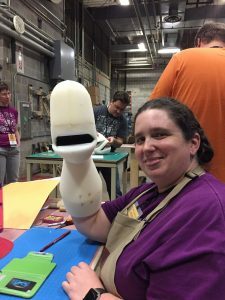 Both patterns were designed exclusively for Beyond the Sock by Pasha Romanowski, who runs the amazing Project Puppet and teaches the building side of the workshop. 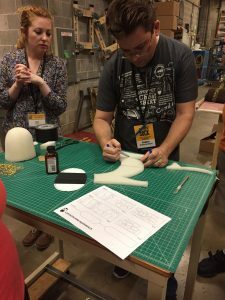 Each year, the overall theme of the workshop is different. 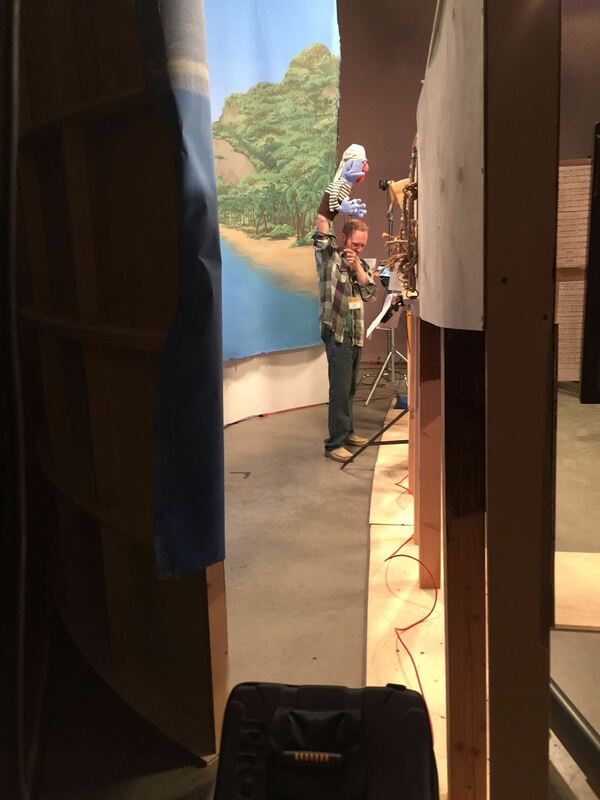 My first year was 2015, which was Monkey puppets on a tropical island. 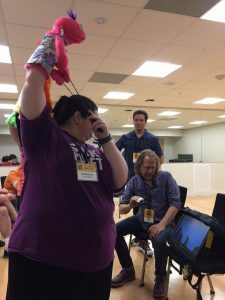 My second year, 2016 was Chicken puppets on a space ship. This year, 2017, the theme was pirates! 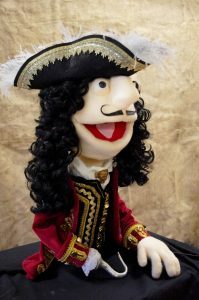 My puppet travelling companion Lucy blogged about our pirate experience. During the workshop, I built pattern B as it was a new head form for me to explore. 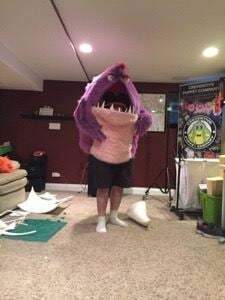 Once I got home to Australia, I wanted to build puppet pattern A before I forgot all the special instructions for that pattern. 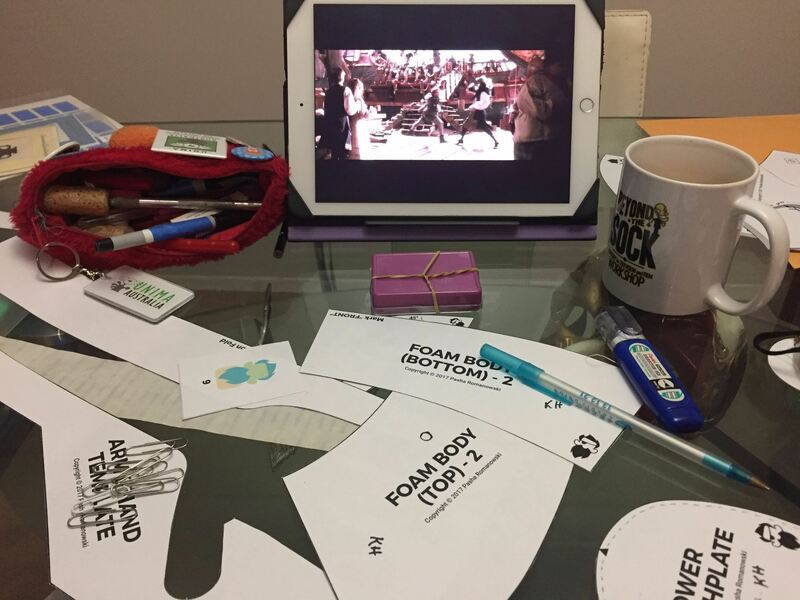 The tricky part was trying to decide what character I wanted to make, but unpacking all my puppets and putting them back where they belong in my house and on the tree at school, I was struck by an “apostrophe” to quote one of my favourite movies. 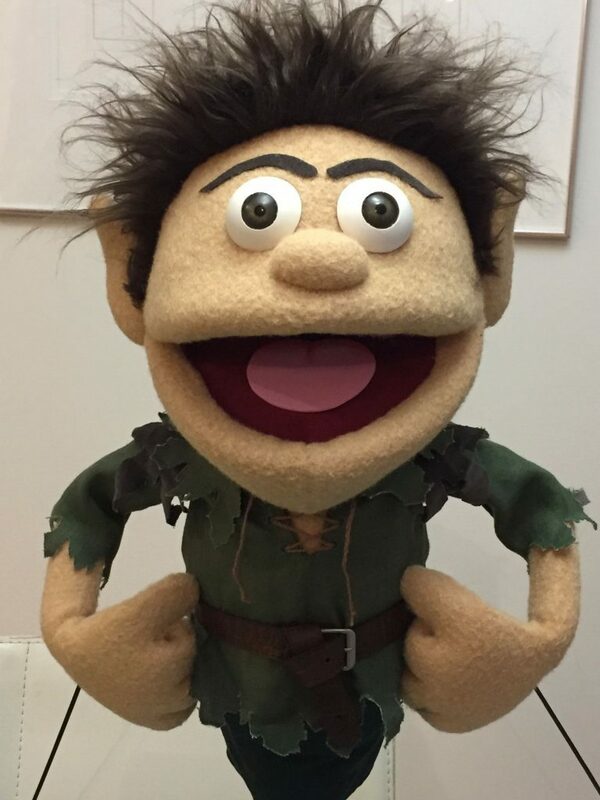 I would make Peter Pan to be a great and worthy opponent to my best ever puppet, Captain James Hook! So design and construction began, I used screen shots of the 1991 movie Hook to design Pan’s costume based on the costume worn by Robin Williams. I wanted to include lots of leaf detail but avoid any reference to the stereotypical costume of Robin Hood which is also a green tunic and tights. 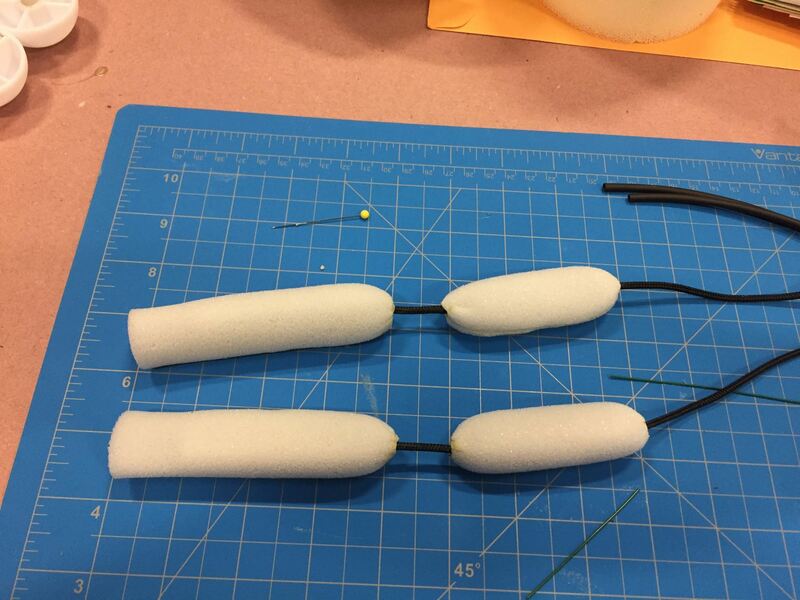 I also wanted to make the ears more elf/ fairy like, and use the same technique for making the realistic eyes that I had used in 2014 when making Hook. 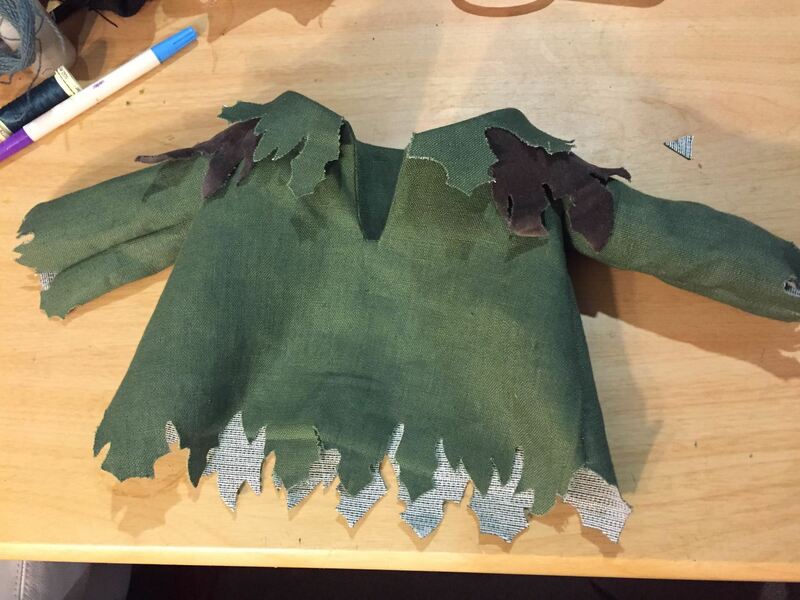 Peter Pan’s skin was made using Nylon Fleece from the amazing Puppet Pelts by Dewey Street. It is skin tone 7. I used Premium Linen suiting for the main fabric of the shirt with cotton velveteen for the dark brown yoke under the collar, and dark green sheeting for the shorts. I was aiming for a colour pallette that reminded me of eucalyptus leaves. The pattern of the shirt was based on the shirt and pants pattern that came with the puppet pattern. 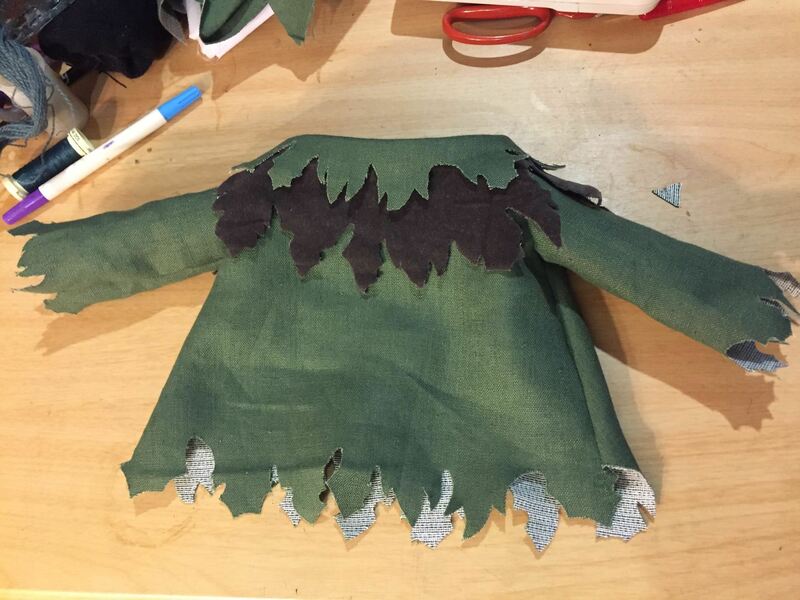 The biggest headache in constructing the shirt was that the edges of the leaf detail keep fraying. I tried to use iron on interfacing to resolve the issue, but in some places, the interfacing hasn’t bonded with the fabric, and I don’t like how the white interfacing is showing up on the underside of the fabric when the puppet moves. 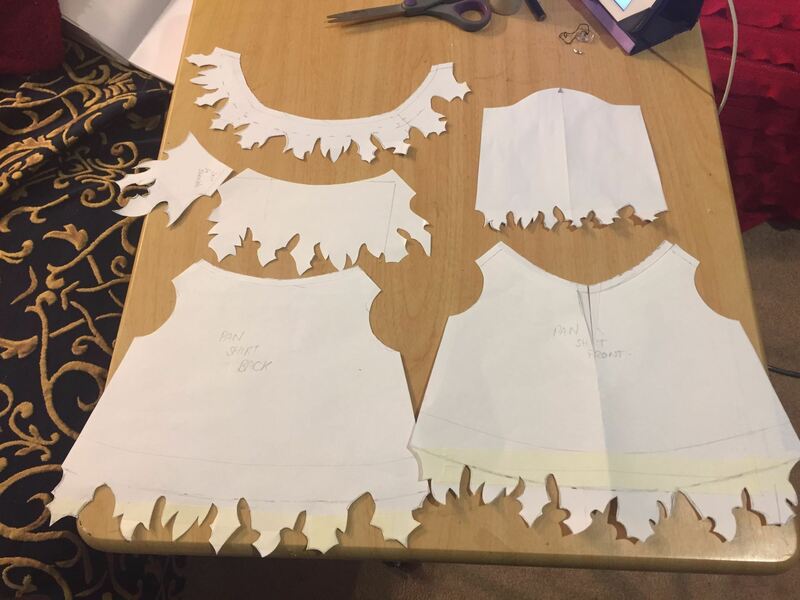 If I could remake the shirt, I would try using visy-fix and glue the same fabric on the underside. I did learn a new technique while making the shirt. I needed eyelets, but I didn’t want metal. I remembered that in the 16th-17th century, corset eyelets were hand stitched. 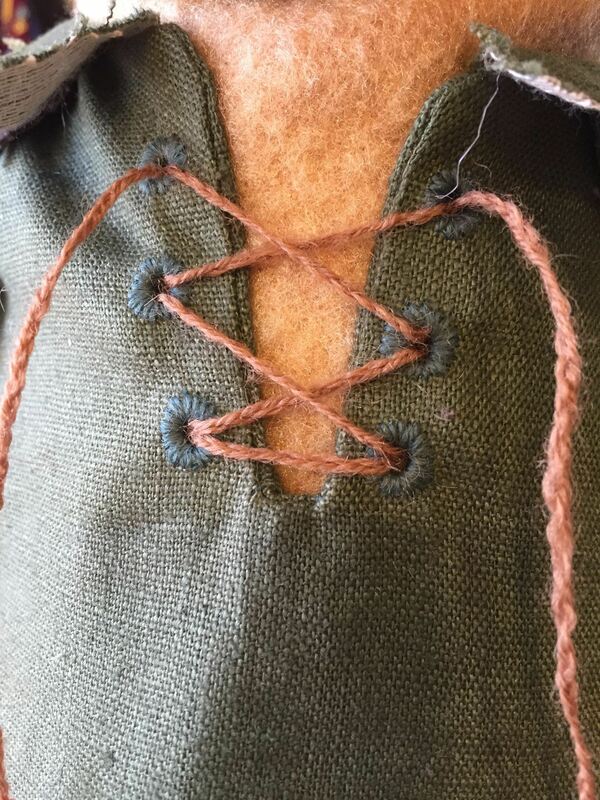 A little bit of research later, I found that the best approach for puppet scale was to baste the fabric around the inner and outer margins of the eyelet, pierce the shirt with an awl, and use a satin stitch in green embroidery wool. Peter Pan’s belt is made from a old narrow belt I found at a charity shop. 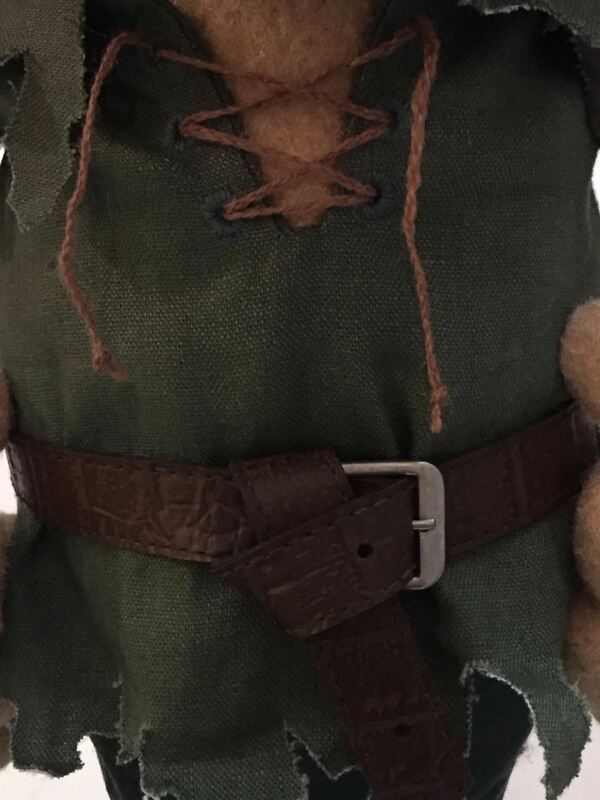 I changed the buckle from gold plated to an old galvanised buckle, shortened the length to fit the puppet, punched new holes and wrapped it at the front so that it looked like the screen shots I had collected of the original costume. I have recently been experimenting with 3D printed puppet parts as an alternative to carved and polystyrene foam understructures. I used ABS plastic to 3D print an oval nose form and covered it in the same Antron fabric as the rest of the puppet using hot glue. 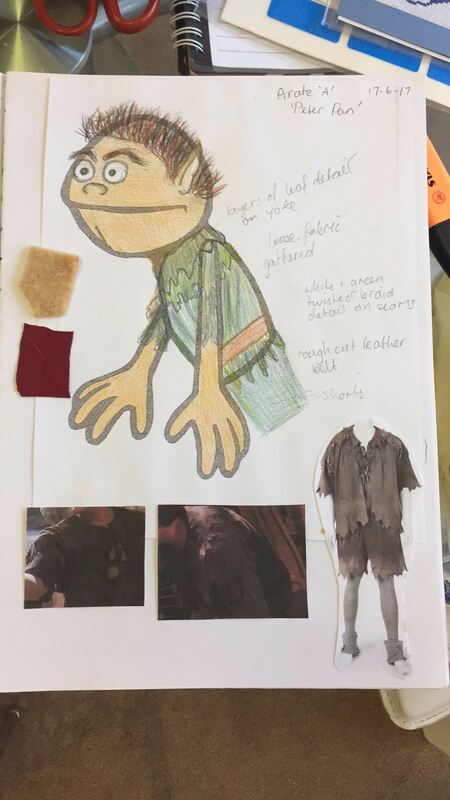 The form was then stitched to the face of the puppet. The eyes were a big challenge. I used realistic taxidermy eyes from Van Dykes Taxidermy in the USA. 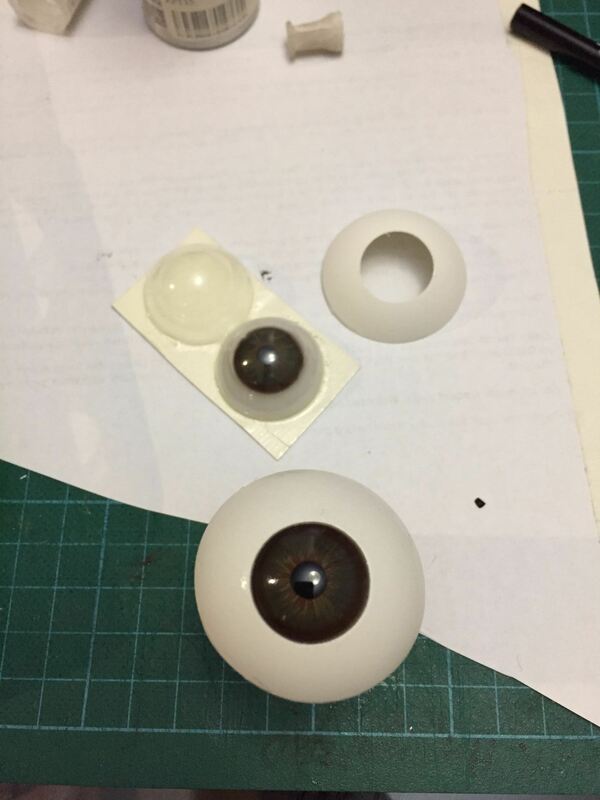 I inserted them into ping pong balls from behind, but the challenge is that there is very little surface area to glue the eye to the ball because of the difference in curved profiles. It is also a big challenge to not have any glue get onto the iris of the eye! The eyebrows were made from the same Mocha cotton Velveteen as I used on the yoke of the shirt. The hair is shaggy brown fur that I laid down in particular directions to get the fur to stand up. I am very happy with how Peter Pan has turned out. I think is a great and worthy pair/ opponent to my Hook. Check out the build progress photos in the gallery below! Designing the shirt pattern. So many leaf shapes! 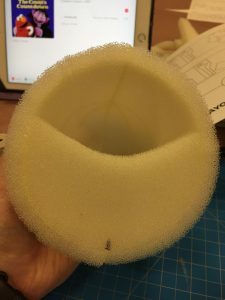 3D printed nose form for Pan. 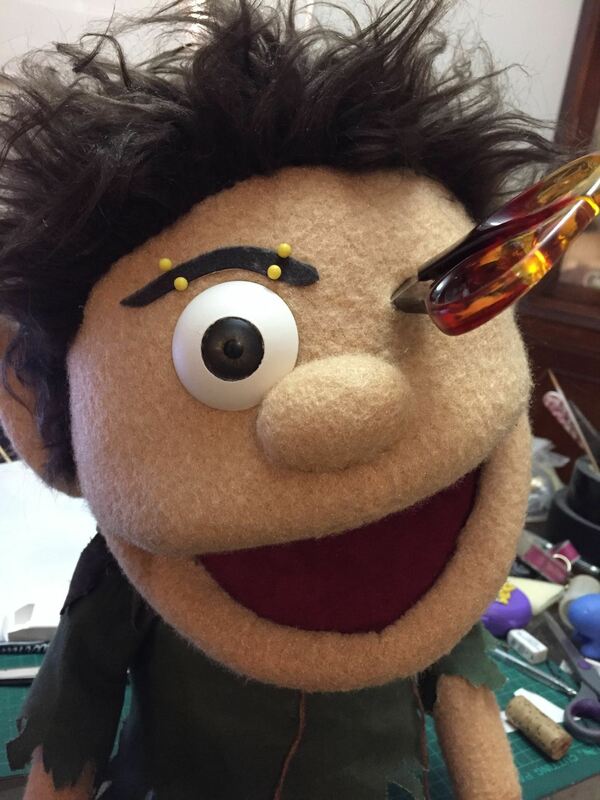 Don't run with scissors!- Attaching the eyes to the head. It’s the last day!!! Nooooooooo! So much has to happen today! First, in the puppetry class, Miss Hannaford had to learn her part of the group song- a karaoke version of the Travelling Wilbury’s End of the Line. Here is the normal version! 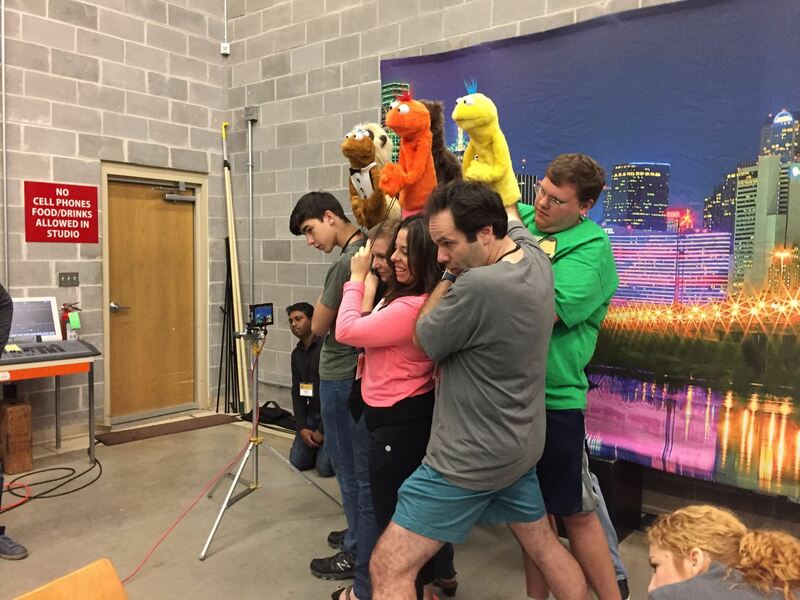 During the performance, each line has to be performed by a different student with their puppet! Next, we watched the playback of the who are you improv game we played yesterday, along with being given critique from our teachers on how we could improve our puppetry technique. Something special happened for Miss Hannaford during the morning puppetry lesson. 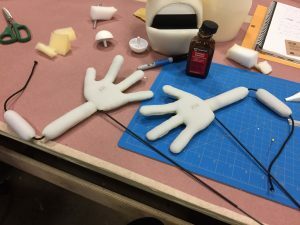 Miss Hannaford’s teacher, Peter, asked her to modify the puppet he was going to use during the show that night so that the puppet had 2 arm rods. 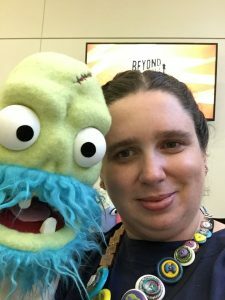 It made her feel valued and respected as a puppet builder to be trusted with something like modifying another puppeteer’s personal puppet. In the afternoon, Miss Hannaford had the final building lesson to finish her puppet. 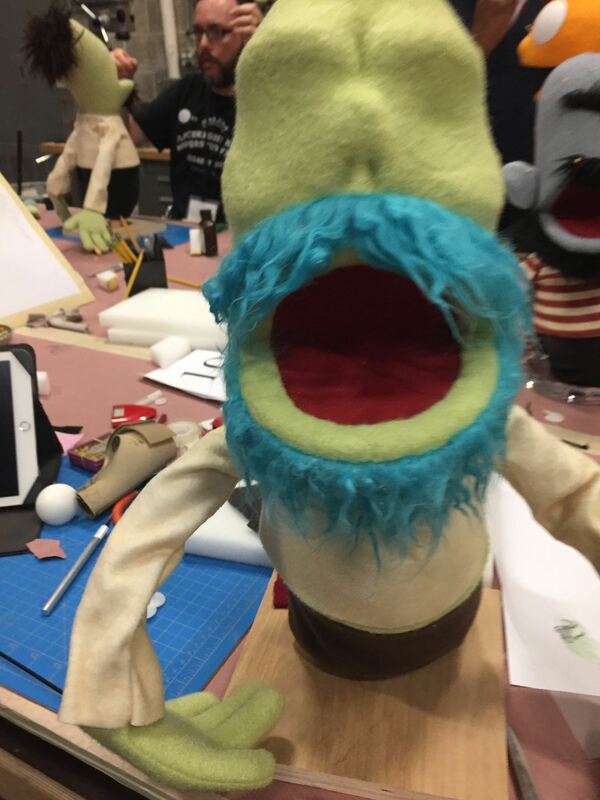 During the lesson, Miss Hannaford had to add the eyes, the beard and moustache, finish sewing the hands closed, attaching the arms to the body and dressing the puppet! Among all those jobs was making the teeth of the puppet. Miss Hannaford needed teeth, but it was really important that the teeth did not prevent the puppet’s mouth from closing properly. 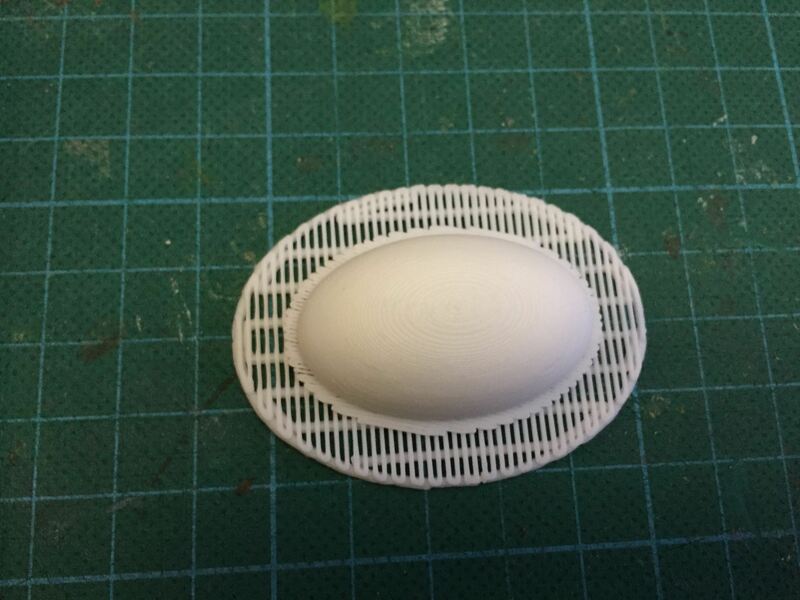 The solution was to use makeup sponges that were cut, then carved with a Dremel rotary tool to make the curved surface. Makeup sponges are flexible enough to bend when the puppet’s mouth is closed but spring back into place when the puppet opens it’s mouth. At 4:45pm there was the first and pretty much only combined group rehearsal of the finale of tonight’s show! Then it was a nice quiet dinner break for Miss Hannaford because for the first time at Beyond the Sock, Miss Hannaford’s puppet was finished before the deadline!!!! At 8pm, it was showtime back in the main studio, but just before showtime, Miss Hannaford got these great photos with puppet building teacher Pasha and her puppet “He’s Dead Jim”. Here are photos of the final performance! Miss Hannaford’s proudest moment was to see her Captain Hook puppet brought to life during the final show by her teachers. 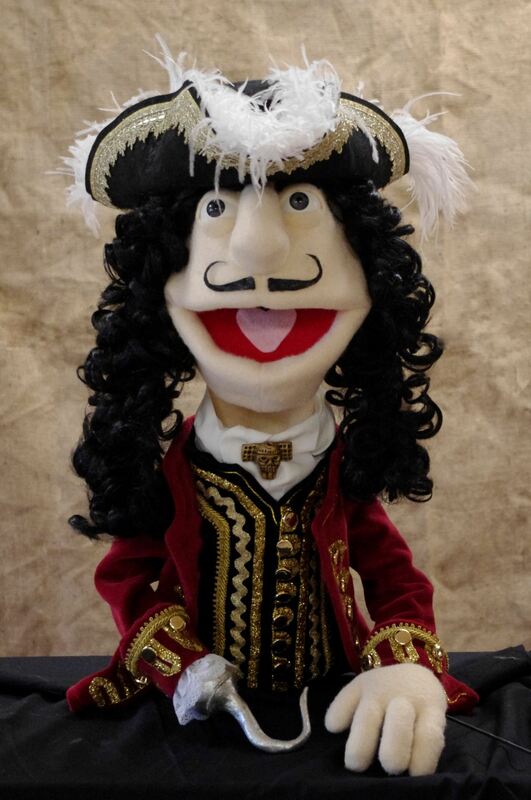 The Captain Hook puppet is Miss Hannaford’s best ever puppet. She made every single part of the puppet including the costume! The only thing she did not make was the wig. This is Captain Hook in all his glory! The group finale performance meant that there were 23 puppeteers and 2 teachers in a very small area! After the show, Miss Hannaford, He’s Dead Jim, and Captain Hook had pictures taken with her teachers Noel and Peter. It has been a wonderful week full of laughter, games and lots of puppets! Tomorrow, Miss Hannaford, the puppets and I are flying directly home. Miss Hannaford is very tired so she will sleep most of the way home. 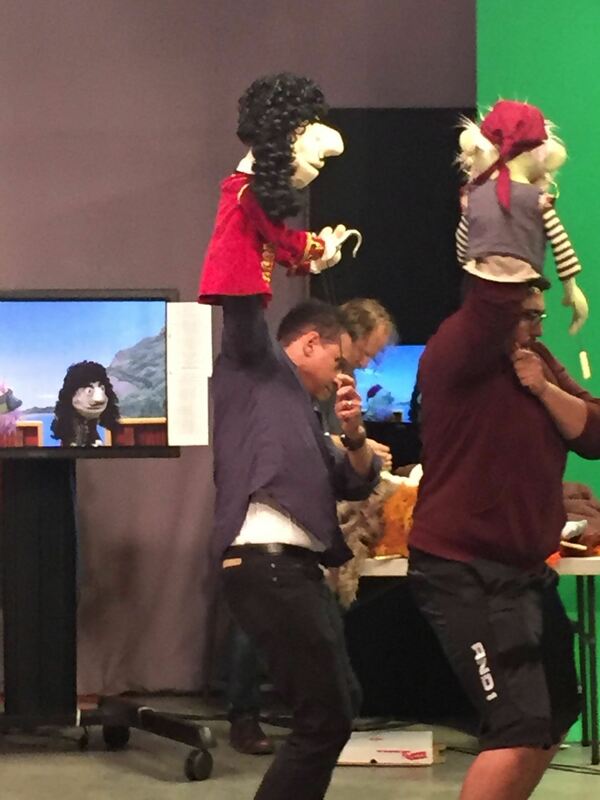 Today Miss Hannaford continued to work on her puppetry in the TV studio. The first activity of the day was one of Miss Hannaford’s favourite activities from Beyond the Sock 2015- Word Pairs Mahna Mahna. 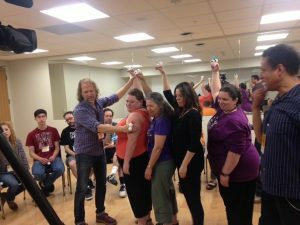 All the students had to take turns in front of the camera to say a word right after the person before them, but the tricky part was to keep the rhythm so as to not break the chain. Some of the word pairs were very funny! The next activity was an game where 4 puppeteers had to construct a story one word at a time! The funniest story was about a Purple dinosaur Jedi Baby! Followed by a game where the groups of 4 puppeteers had to construct a different story one sentence at a time! There was a great deal of silliness which made the lesson so much fun! Miss Hannaford was really excited during the class because her teachers Noel and Peter gave her a quick lesson on using a live hand puppet. 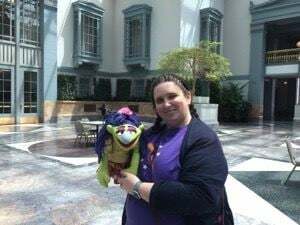 One of our puppet travelling companions is No Name, the purple live hand monster that Miss Hannaford made in 2011. 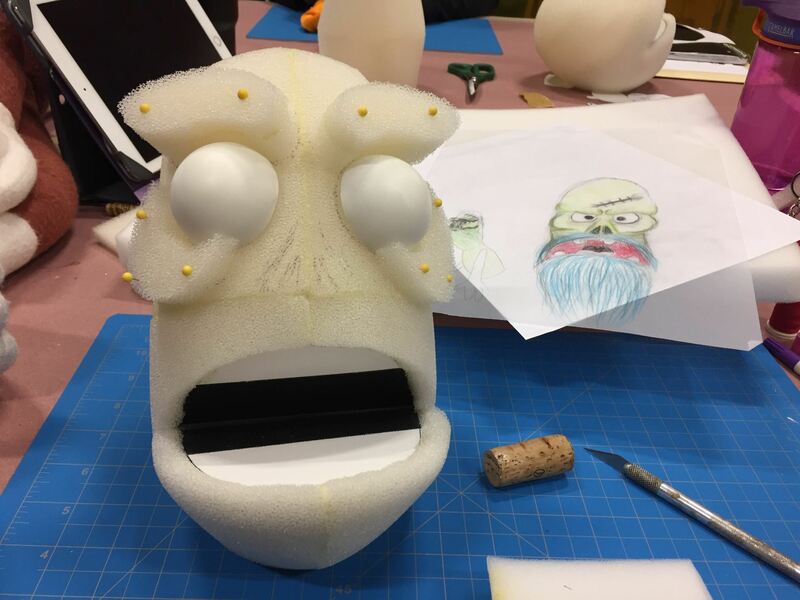 Having No Name in the studio with us, gave other students the opportunity to learn how to perform other kinds of foam puppets . Miss Hannaford also learnt a valuable lesson in why foam puppets like the Muppets, don’t have flat eyes. When the puppet turns sideways to the camera, the audience can’t see both eyes! After lunch, was the next puppet building class. In this class, Miss Hannaford learnt a new way to make puppet arms. She has never made arms with foam muscles around string before! 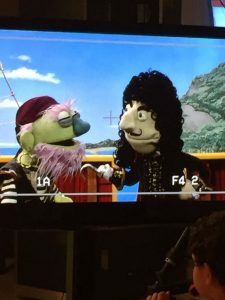 During the lesson, the puppet building teacher Pasha, came around to show Miss Hannaford how to carve down the brow bone and cheek bones on her ghost pirate so that they looked more natural. The first step was to glue the bone pieces onto the skull, including doubling the thickness of the brow bone, then my teacher, Pasha used a blade to carve the bones into smoother shapes. The last step was to use a Dremel tool to smooth out the bone pieces. The next step was to start covering the face with the fleece. To make the fleece take the form of the bones, it was important to use small dabs of hot glue inside the nose, under the cheek bones, between the eyebrows and above the eyebrows. The back of the head was then sewn closed using the ladder stitch. Tomorrow, everything has to be finished including learning the lines of the group song! 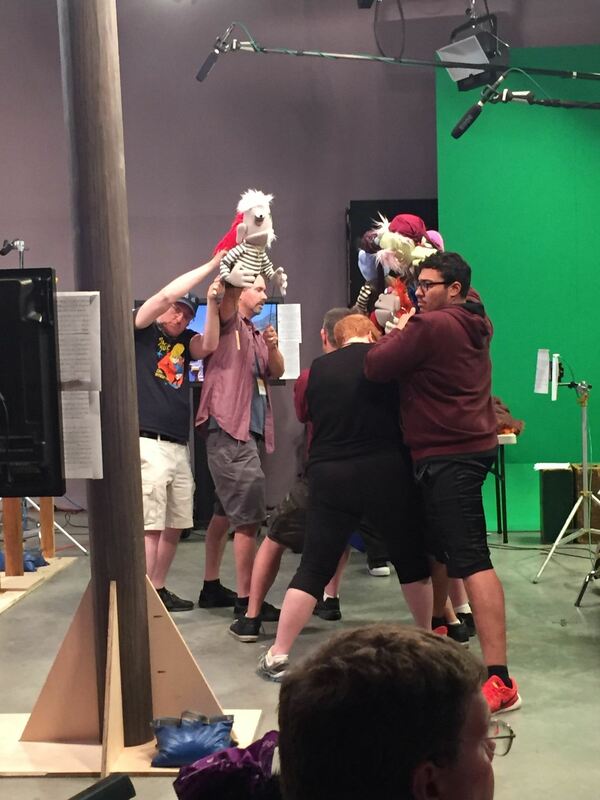 Today the puppeteering class moved to the television studio with real tv cameras! The first exercise was to practise entering the camera frame, focusing the eyes of the puppet in the camera and having the puppet talk about where it was and where it will be going. This was so everyone could practise what we had learnt yesterday. Today, Molly, my pink travelling companion in the flowery dress, and Coco, the Terry Angus Dog were the puppets Miss Hannaford used the most in class. We also worked on sharing the frame with other characters so that the camera shot had a nice composition. 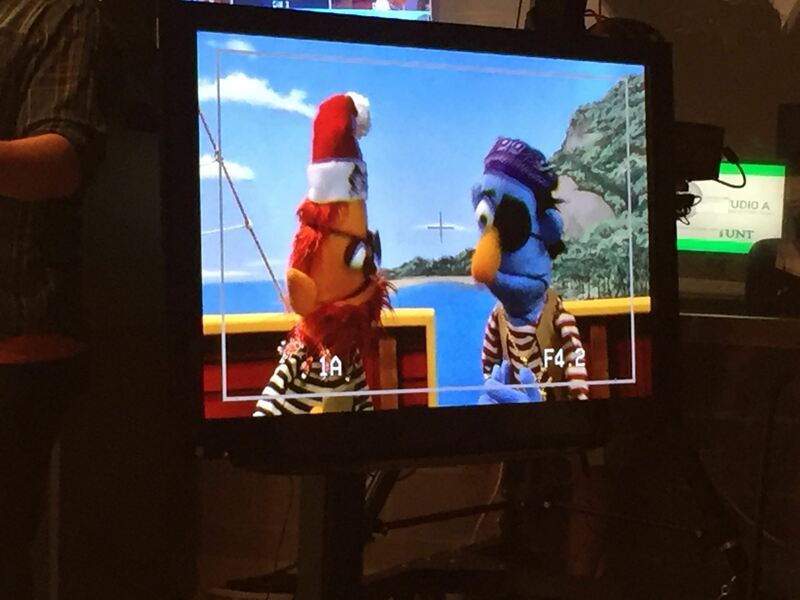 It can be really tricky to share the frame with other characters, especially when the puppeteers are different heights. 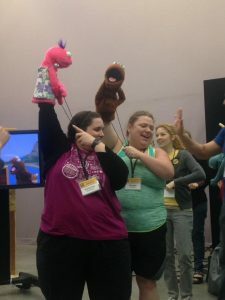 Sometimes our teachers would have to sit on chairs in front of the class to puppeteer as they are much taller than Miss Hannaford and I, but they needed to be in front of the class so that they could lead the activity. 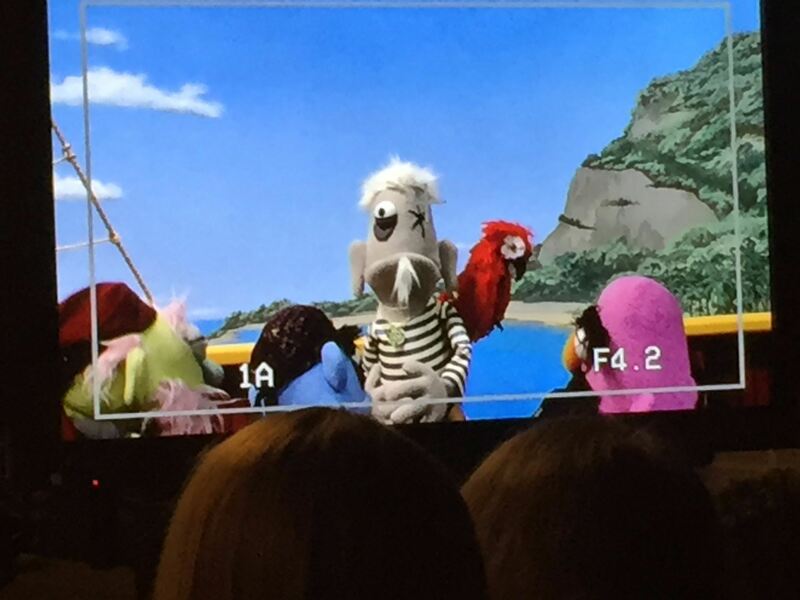 One of the things that Miss Hannaford found difficult was moving a puppet through the depth of field of the camera. We had to start moving the puppet from the back of the set, up to the middle of the frame and then move to the right of the frame, keeping the puppet on camera for as long as possible. 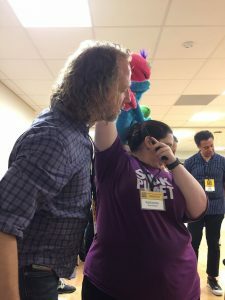 It is really hard to do and the only way Miss Hannaford was able to get close, was if her teacher Peter, put a puppet we were calling Coffee Monster at the top corner of the camera so that the puppet Miss Hannaford was using had something real to look at! Using depth of field is something Miss Hannaford needs to really work on improving. 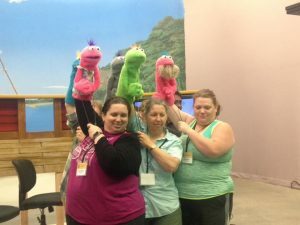 After our delicious lunch at a healthy sandwhich shop, it was time for the next puppet building class! 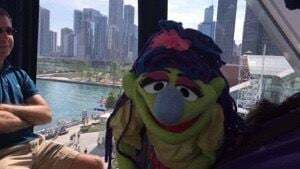 The first thing Miss Hannaford wanted to do, was to have our puppet travelling companion Coco the Terry Angus Dog sit next to Terry, the Terry Angus Dog who belongs to Pasha Romanowski. 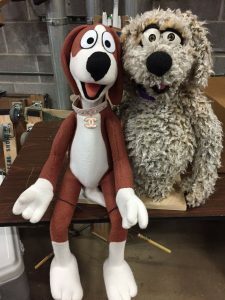 Terry was the dog from the instructions Miss Hannaford followed to build Coco, so to have the two dogs together in the same place was really special to Miss Hannaford. It was also an opportunity to compare the results of the building side by side! During class, Miss Hannaford started to add the bone structure to the face of her pirate using special curved foam shapes that went around the eyes. The process started by sketching the bone shapes lightly on the foam around the eyes that were going to be used. Then, Miss Hannaford used tracing paper to make paper patterns of the bone shapes on one half of the face. In this photo, the “bones” are just pinned on. After class, all the students and teachers met after dinner to work on sewing, performance ideas or to just chat. 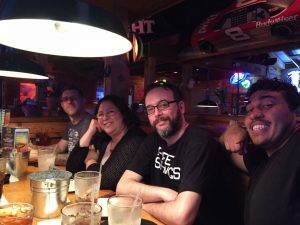 Day 12: Wednesday, June 7th, 2017. Lip sync- making the puppet look like it is talking. 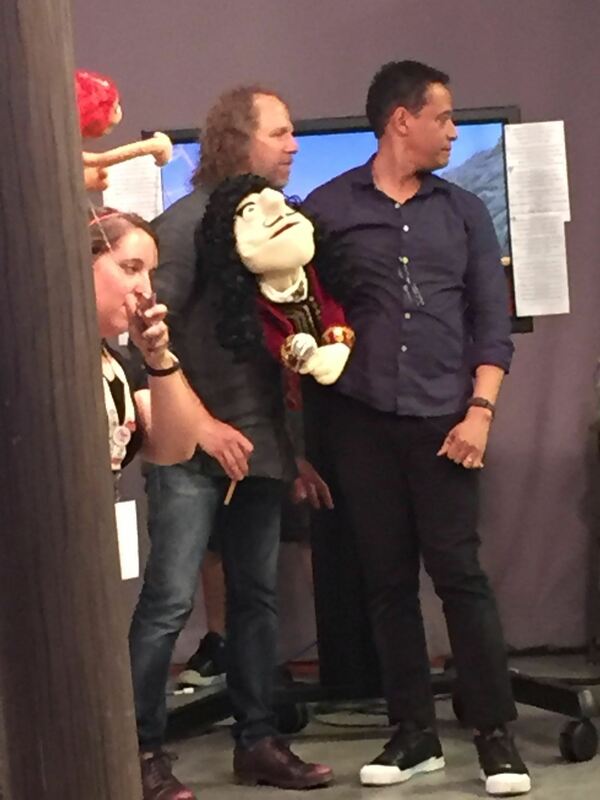 Focusing the eyes of the puppet on camera so that it is looking at the audience. 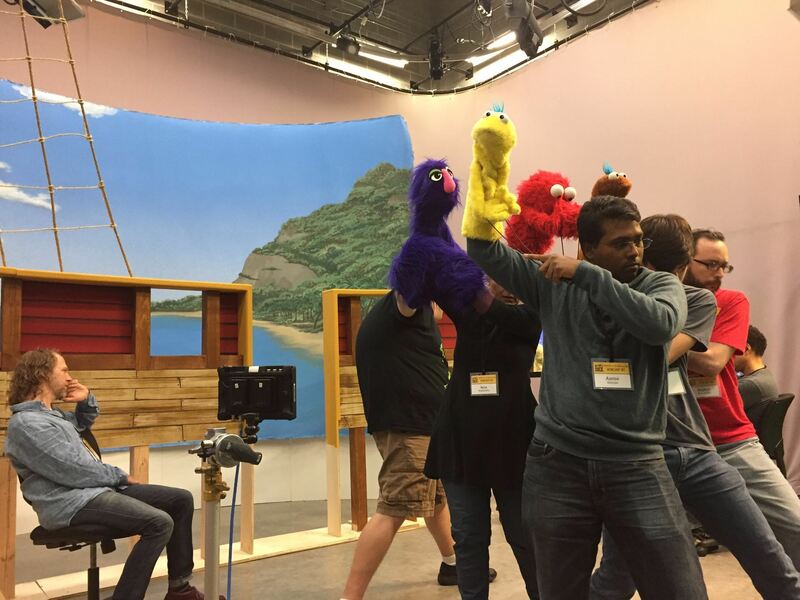 Utilising the puppeteer’s hand’s full range of motion to achieve a full range of emotion. 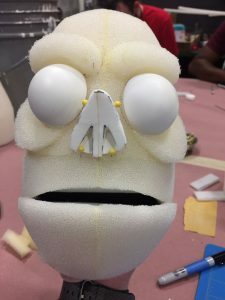 Tilting the puppet’s mouthplate so that the puppet can look at other characters or places. 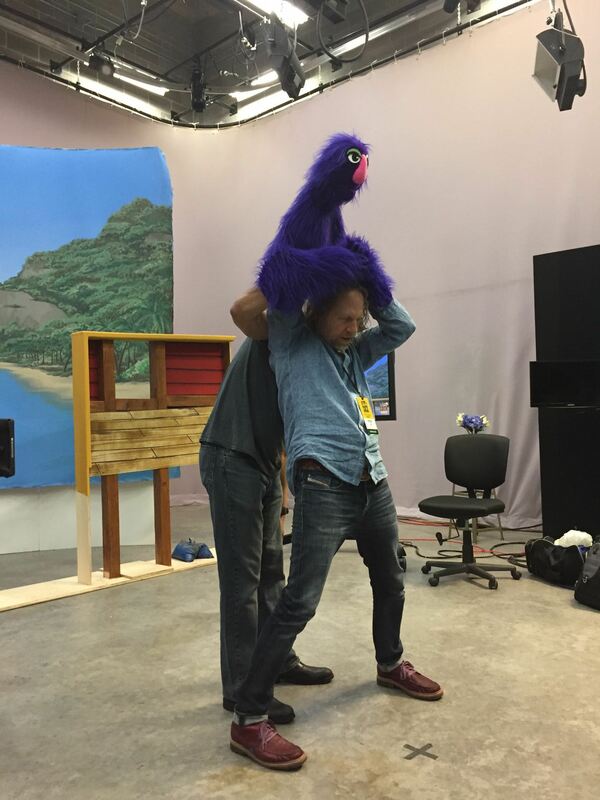 Learning to create the illusion of a puppet walking in and out of the camera’s frame. Miss Hannaford got very excited when after she practised with my travelling companion Molly, the puppet walking exercise in front of her teachers, and one of them said “perfect”! 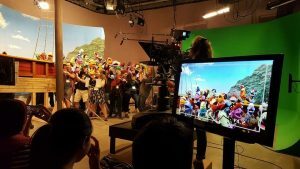 It was the first time in two years of learning puppetry for television and film that she had gotten that kind of feedback. Miss Hannaford has been practising at home and at school a lot, hoping that one day she would hear from her teachers that she is improving. 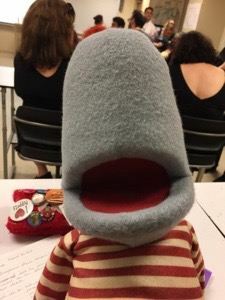 My new puppet friend Yoop, who we made last week in New York, was picked up by Miss Hannaford’s teachers as an example of a sock puppet with a flexible mouth! Towards the end of the lesson, the students got to play a really fun game of moving the puppets as a group around the frame without tripping over each other as puppeteers. 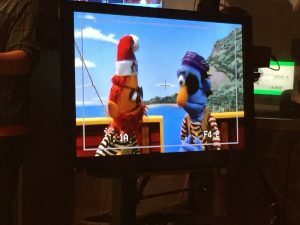 The rules were that the puppets were not allowed to touch the edges of the tv frame and when freeze was called, the puppet had to look directly at the camera. After lunch, Miss Hannaford’s group moved to the puppet building room to start construction of her pirate. 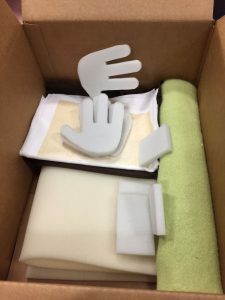 The first step was to open the boxes of supplies and start cutting out the materials. 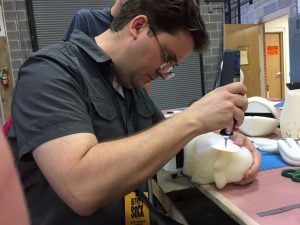 Miss Hannaford’s puppet building teacher, Pasha Romanowski demonstrating how to insert the puppet’s mouthplate. By the end of the day, Miss Hannaford had the entire body and head of the puppet’s skeleton assembled. After class, many of the students had dinner together at the steak house restaurant next to the hotel. Today was the first day of Beyond the Sock Puppetry Workshop in Texas! Our day started quite early with the bus collecting the workshop students at 9:45am from the group hotel. Once we completed registration, the students were taken on a tour of the workshop facilities including the puppet building workshop and the real television studio! While we were in the television studio, we got to see this year’s set! It’s a pirate ship! This means that the students are going to be making Pirates! Main Characteristics- what does the puppet look like? Personality Trait- is the character happy, sad, angry, grumpy, friendly, mean? Attitude to go with the personality. 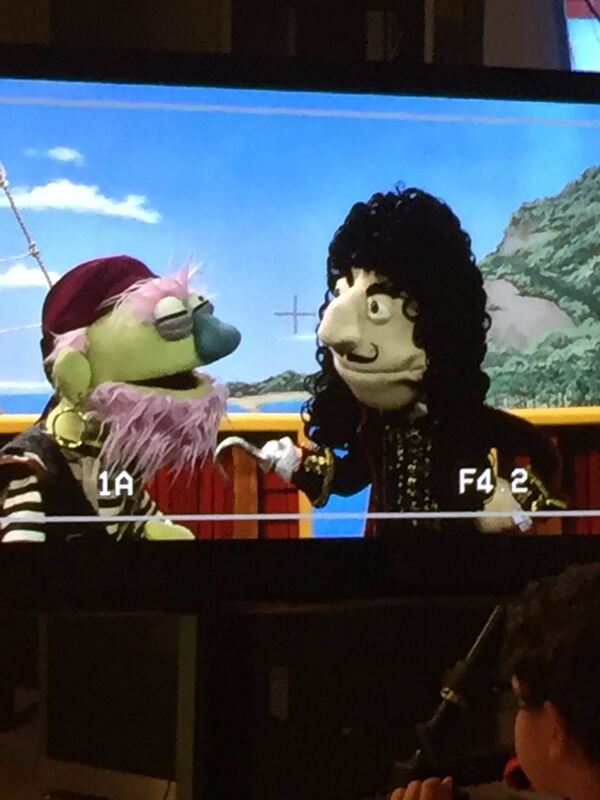 This year is really exciting because there are 2 puppet shapes to choose from! Shape A has a big, round head, and shape B has a tall narrow head. 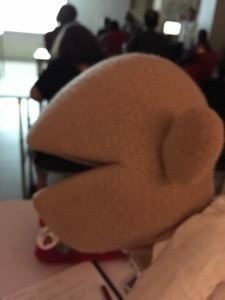 The building teacher Pasha, had two sample puppets for the students to try on. Students then had to put their hand in an envelope for a lucky dip of the fleece and fur colours they were going to use. 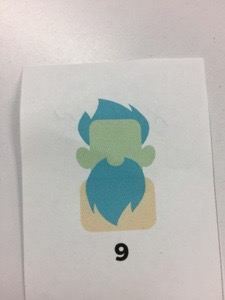 Miss Hannaford got number 9 which was a light green fleece and bright blue fur! 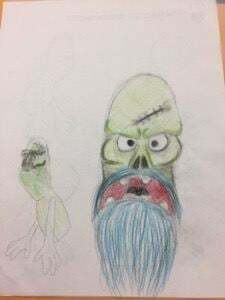 Students were then handed design sheets to start sketching ideas for their pirates. Miss Hannaford had the idea of making a ghost pirate because of the fleece and fur colours she was given! Here’s what the design lesson looked like! 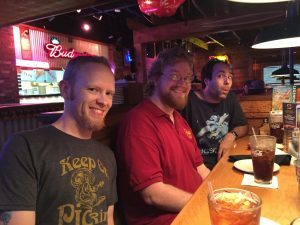 After class, there was an informal dinner for everyone attending the course. 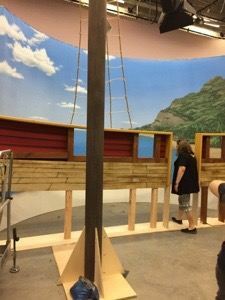 Tomorrow, construction of the pirates and learning to puppeteer commences! Today we went with our friend Connor to the Field Museum near the shore of Lake Michigan. 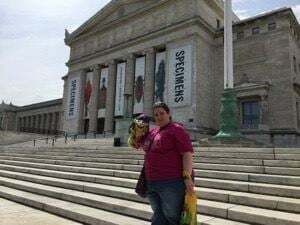 The Field Museum is hosting the Jurassic World Exhibition. 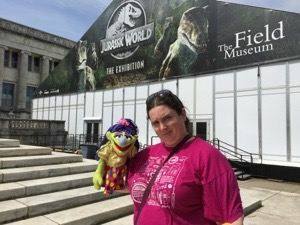 Both Connor and Miss Hannaford wanted to see the exhibition because of their interest in animatronics and Stan Winston Studio/ Stan Winston School of Character Arts. 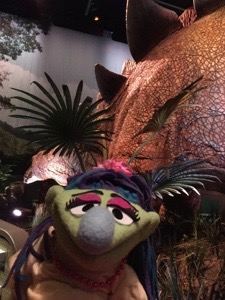 The Field Museum is a museum of natural history, so when we entered, we met Sue the Tyrannosaurus Rex! The dinosaurs inside the Jurassic World exhibition are truly alive! They are such amazing animatronic creatures and they are constantly moving giving the illusion of life. 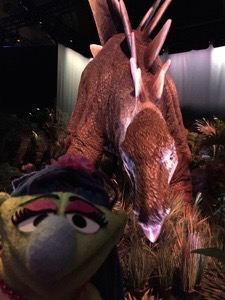 After the amazing T-Rex encounter, we came into the next part of Jurassic World and came face to face with a Stegosaurus! We were then rudely interrupted by Indominus Rex in the next paddock! 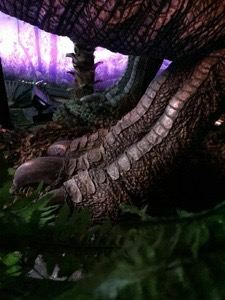 Here are the feet of Indominus Rex! On our way out of the exhibition, the Tyrannosaurus Rex tried to eat me!!! 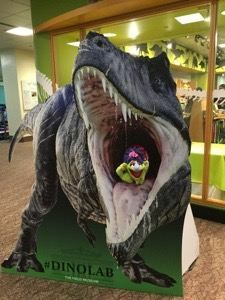 Fortunately, I wasn’t very tasty, so the T-Rex spat me out. Miss Hannaford and Connor spent the rest of the day working on building the monster puppet. It is nearly finished. Connor just needs to add the legs, the horns and permanently attach the teeth. Tomorrow, Miss Hannaford and I fly to our last stop on this trip- Texas and Beyond the Sock! Today we flew from Chicago to Dallas Fort Worth in Texas. 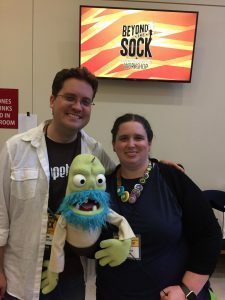 The Beyond the Sock Puppetry course Miss Hannaford attends, is held in Denton Texas, which is 30 minutes from the airport. We got to our hotel, unpacked all of my fellow puppets who are travelling with us, and met up with 4 of the other students who are attending the course for dinner at the local Italian restaurant. 3 of the students have never attended the course before, but Miss Hannaford was really excited to catch up with her friend Mike, who has attended the course since 2015 with Miss Hannaford! We stayed up late talking in the hotel lounge and met several other new students! One lady has travelled all the way from Israel, another lady has come from Sri Lanka and one of the other students has come from Atlanta, Georgia here in the USA! This year is a very international mix of students and we haven’t met everybody yet! Today was a really interesting day! Miss Hannaford and I enjoyed a tour of downtown Chicago led by our friend Connor Asher. 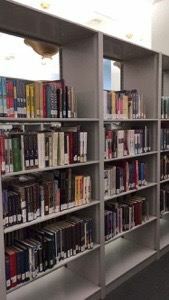 Our first stop was the Harold Washington Library. 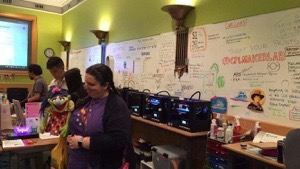 We visited here last year while we were in Chicago, but Connor had not seen the amazing Maker Lab that is open to the public. 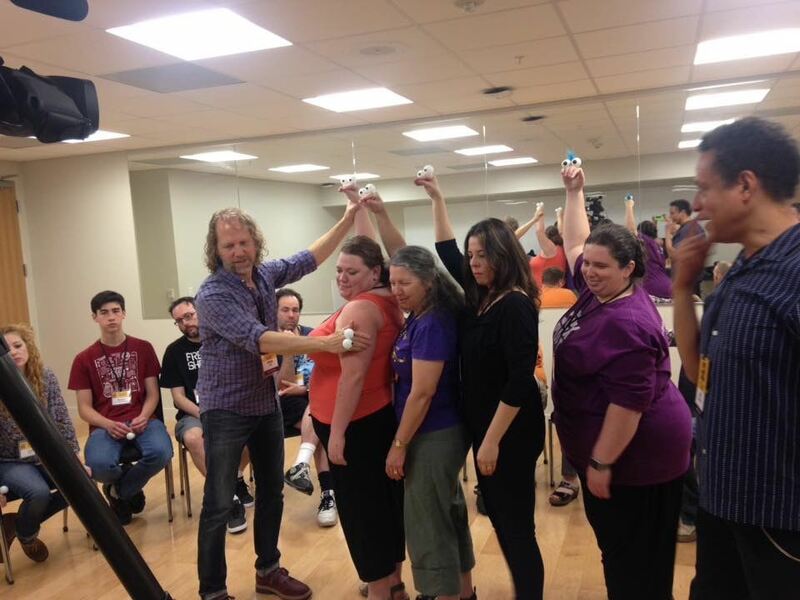 Miss Hannaford model’s the school library maker lab on the Chicago public library maker lab. 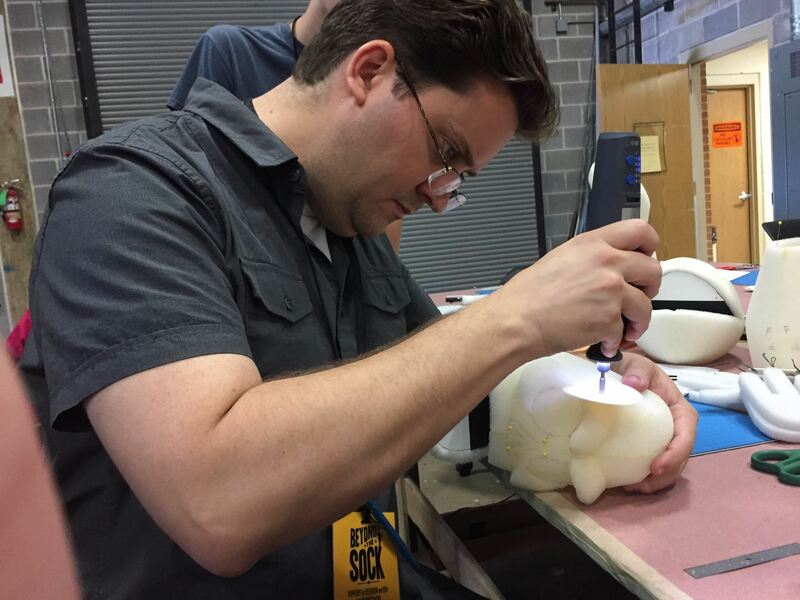 They have four 3D printers, 2 Laser Cutters, 2 vinyl cutters and a desktop cnc machine! The maker lab staff gave us a tour of the machines and the following links to useful resources for making cool things. When we left the makerlab, we went up to the beautiful Winter garden on the top floor of the Library. We then showed Connor where to find all the wonderful puppetry books on the Library shelves. 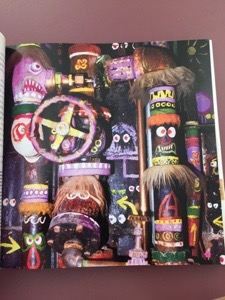 We even found a copy of Miss Hannaford’s favourite book Jim Henson: the Works which has one of the best photos of the Muppet Pipes we saw a few days ago. Our next stop was the Disney store since we don’t have Disney stores in Australia. Unfortunately there was no Muppet merchandise on sale that day. We then walked down to the Navy Pier which is a very famous local attraction in Chicago. 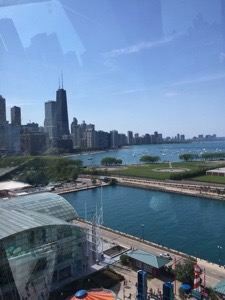 We went on the Ferris wheel, which gave us a lovely view of the Chicago skyline. Today Miss Hannaford and I spent the whole day assisting our friend Connor at his workshop. 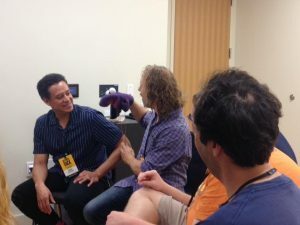 We spent the day working on fixing puppets including my travelling companions No Name (a purple live hand monster), and Joop the sock puppet. No Name needed her fur trimmed, and Joop needed new hands. Miss Hannaford kept working on the large purple monster. One of things we got to do was go to a local fabric store to buy supplies. 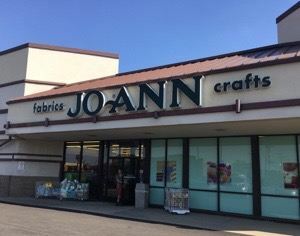 Joann fabrics is one of the many places in America to buy puppet building materials. It is similar to Lincraft and Spotlight in Australia, but it has a much better range. That night we were invited to attend a tv monitor Puppetry evening for other local puppeteers and puppet enthusiasts. This gave Miss Hannaford a chance to practise her puppetry skills ready for next week’s workshop at Beyond the Sock. 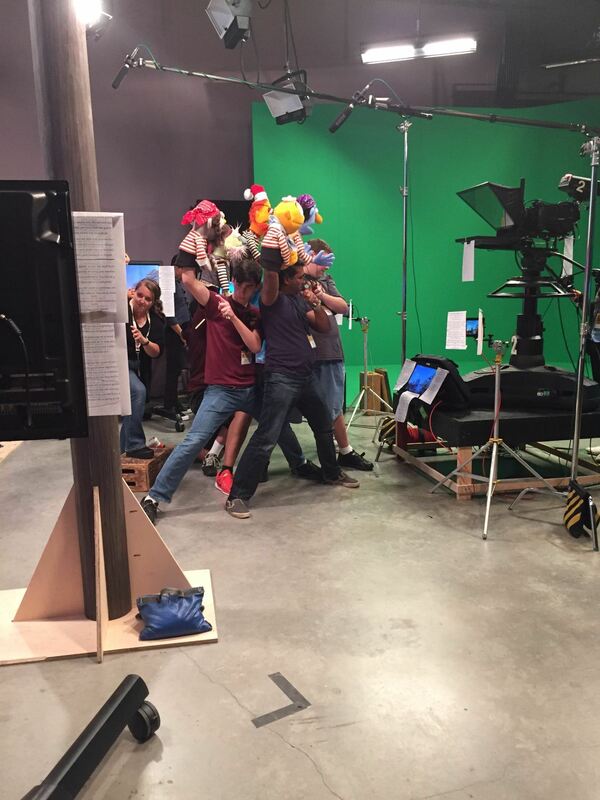 This is what all the puppets looked like at the end of the monitor night! 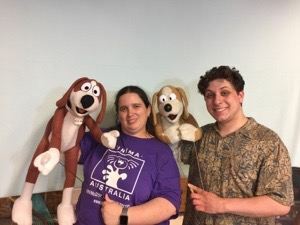 Miss Hannaford was really excited to meet another local puppeteer and puppet builder – Frank Cesario who had built a Terry Angus Dog puppet like Miss Hannaford’s dog Coco. The dog’s name is Dante Morty. 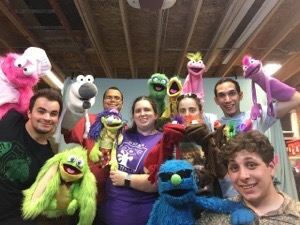 It was a very long, but happy day of puppet building and performing! Today Miss Hannaford and I flew from New York to Chicago. We left the hotel at 7am and our flight left Newark airport at 11am. It took 2.5 hours to fly to Chicago. Once we got to our hotel, we were both very tired after our long day yesterday, so we had an afternoon rest until dinner time. 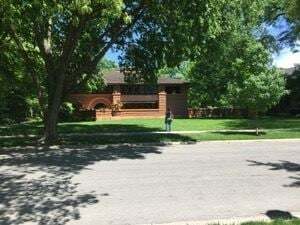 Today we went on a tour of the home and studio of famous architect, Frank Lloyd Wright as well as a walking tour of Frank Lloyd Wright designed buildings in the local suburb of Oak Park. Frank Lloyd Wright was born in 1867 and is famous for innovative use of materials, spaces and interior decorations. 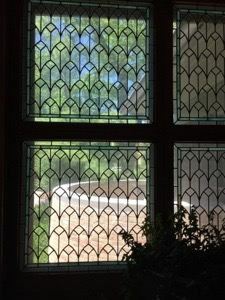 When a client commissioned Frank Lloyd Wright to design a home, Wright designed not only the house, but the art glass windows, skylights, furniture and wall decorations. The client only needed their clothes and tooth brush to move in. The first Frank Lloyd Wright building we ever visited was the Guggenheim Museum in New York back in 2014. 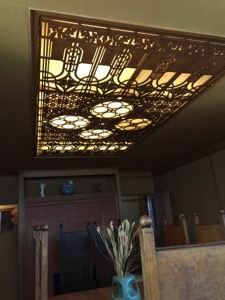 There is a connection between Frank Lloyd Wright and Australia. Two of Wright’s architectural employees were Walter Burley Griffin and Marion Mahony who together won the competition to design Canberra- the national capital of Australia. The whole tour of the home, studio and the buildings in the rest of the suburb took 3 hours. Outside the entrance to Frank Lloyd Wright’s home. 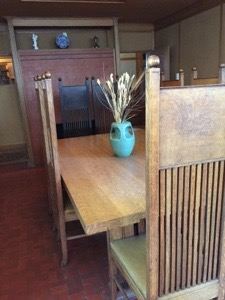 The Dining Room- Wright designed the chairs, table, art glass ceiling panel and the art glass window pattern. 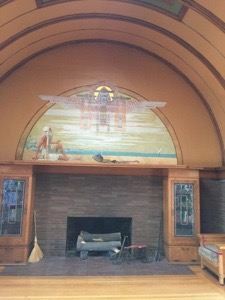 The children’s playroom on the top floor of the house- with Egyptian/ Aztec influence mural on the wall. 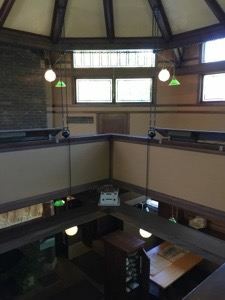 Wright’s drafting studio for his employees- taken from the upper gallery level. Wright’s Conference room known as “The Library” where he would show his designs to his clients. 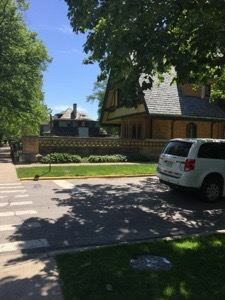 Then we started on the walking tour to visit the other Wright designed buildings in the neighbourhood. 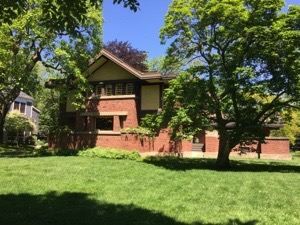 This house was initially designed by Frank Lloyd Wright, but because he went overseas before it’s completion, the house was completed by Marion Mahony, the wife of Walter Burley Griffin. 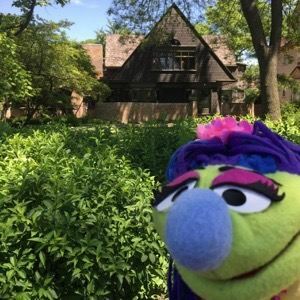 After the tour around Oak Park, Miss Hannaford and I visited our friend Connor Asher who is a Chicago based puppet builder. 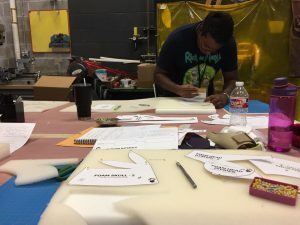 He invited us to visit his new workshop and assist with building a monster body puppet he has been working on for the last few weeks. Miss Hannaford provided assistance with solving problems with the arms and helping the puppeteer to see out of the mouth of the puppet.